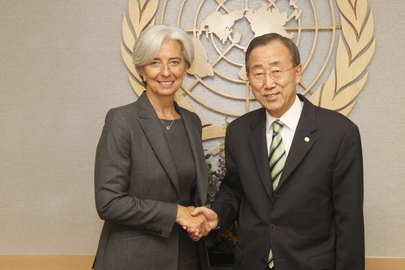 UNITED NATIONS, October 20, updated Oct 24 -- The IMF comments on the Occupy Wall Street protests on Thursday, a month after they began and two weeks after ignoring a Press question about them. Spokesman Gerry Rice said, "the frustration that being voiced by people over the state of the global financial system is understandable. This crisis has hit ordinary people very hard. Their trust in the financial system overall has suffered. That's why the Fund has been working with other to help reform the global financial architecture so that all people not just a few can benefit from it." On Yemen, what's the status of the IMF's work? Masood Ahmed met Ali Saleh's Finance Minister Nu'aman al-Suhaibi on Sept 25 - is he part of the immunity being offered by the GCC initiative? What does the IMF think of the GCC initiative, specifically its immunity provisions? On Myanmar, will the IMF's current mission there meet with the National League for Democracy, Aung San Suu Kyi or any opposition figures? On Belarus, the head the National Bank Nadezhda Ermakova has said IMF might deny a program based on "politics," also called recent visit positive. Which is it? How does IMF view Belarus, including human rights? Despite its rhetoric, the IMF under Christine Lagarde has become more and more of an insider's game. We will add whatever answers come in after deadline -- and we will continue reporting on it. The IMF does not set political conditions for its loans, but all loans need to be approved by the IMF's Executive Board, which contains representatives of all countries. As the mission has said in a press release issued on Monday, October 17, “Before program negotiations could begin, as a first step, the authorities will need to demonstrate a clear commitment—including at the highest level—to stability and reform and to reflect this commitment in their actions. Meanwhile, the IMF staff will continue to work with the authorities to help them design policies to restore stability and prosperity. On your question during our press briefing last Thursday regarding Sri Lanka, we can let you know that the Sri Lankan government remains committed to further deficit reduction in 2012, and we look forward to discussing the details of the budget during the upcoming staff visit, currently planned for December. We have written back to him.